Below are answers to many questions we receive. If you have a question that isn’t answered below, please email us!. Once I receive my card, how do I use it? What happens if I change pharmacies? Can I use this card with my current insurance? Do I have to qualify to use this savings card? Can I use this card on over-the-counter medications? How much does the card cost me a year? 1. Once I receive my card, how do I use it? Once you have received your prescription drug benefit card you can use it immediately. Simply bring the card with you to the pharmacy and check out just as you would normally. Once at the register you can present the pharmacist with your drug benefit card. The pharmacist will then take the required information and use it to process your discount. Once this information has been stored, your pharmacist will then continue to check you out and your final balance will reflect the discount. Upon checkout you will be required to pay the pharmacy the amount owed that includes your discount. Once you have received your card you want to ensure that you keep it in a safe place. 2. What happens if I change pharmacies? The beauty of your prescription drug benefit card is that even if you change pharmacies your discount will still apply. All you will need to do is bring your card with you to the new pharmacies so that they may enter your information into their database. Your card will have the ability to earn you your benefits at a number of pharmacies across the country. Each time you change pharmacies just ensure that you bring your prescription drug card with you. For individuals who are currently insured, there are restrictions on what pharmacies you will be able to use with your current insurance. Always check with your insurance provider to determine if the pharmacy you have chosen is in their network. For individuals who are not insured, they will be able to utilize the insurance benefit card at any participating pharmacies. 3. Can I use this card with my current insurance? One of the best ways to use your prescription benefit card is to combine it with the coverage that you receive through your existing medical insurance. In doing so, you will then be able to generate maximum savings on prescriptions that you are seeking to fill. For individuals who are underinsured, the cards help by reducing the cost of their already expensive prescriptions. It is recommended that the card be used regardless of insurance coverage as you will still be able to reap monetary discounts when you put the card to use. 4. Do I have to qualify to use this savings card? No, there are no entry requirements or health restrictions. This card is readily available for anyone seeking to save money on their medical prescriptions. 5. Can I use this card on over-the-counter medications? This card is designed specifically for discounts on prescription drugs and medications that have been individually prescribed to you by a licensed physician. Over-the-counter medications are not covered in this card program. 6. How much does the card cost me a year? 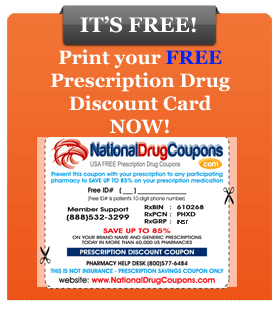 This prescription drug savings card does not cost you anything and is issued and no personal cost to you. The card is a true benefit to its recipient and will allow you to save money on your prescribed medications.